Over Thanksgiving, my sister and I met up at my parents’ house as per tradition. Whenever we’re back at home we’ve tried to continue our own tradition of sorts and take the time to play some tabletop games. On this particular holiday, my sister brought with her the card game Dominion and over the long weekend we played it several times, largely on the insistence of my kids. I won every single game. Before my sister hopped on the bus that would take her to the train that would return her to the big city, she downloaded the Dominion iPad app. As soon as I had spied her playing it on the sofa, I knew that if I didn’t do the same I would likely be trounced come Christmas vacation. With that app, my sister could play many more games of Dominion against a range of players than I could with my paper cards and small circle of patient friends. Perhaps it was because I had just finished The Game Believes in You and so was primed for the insight, but it was in that moment when I realized that I really did believe in the learning potential of video games. I suddenly saw how such games act as a well of potential that one can draw upon again and again and as such, they can provide for a capacity of learning that is difficult to match. You may be surprised to know while I have long been an advocate of the learning potential of games, I have always been somewhat hesitant at making the same claim towards video or computer games. I think this was because, until recently, there were very few educational games that I felt I could personally recommend. 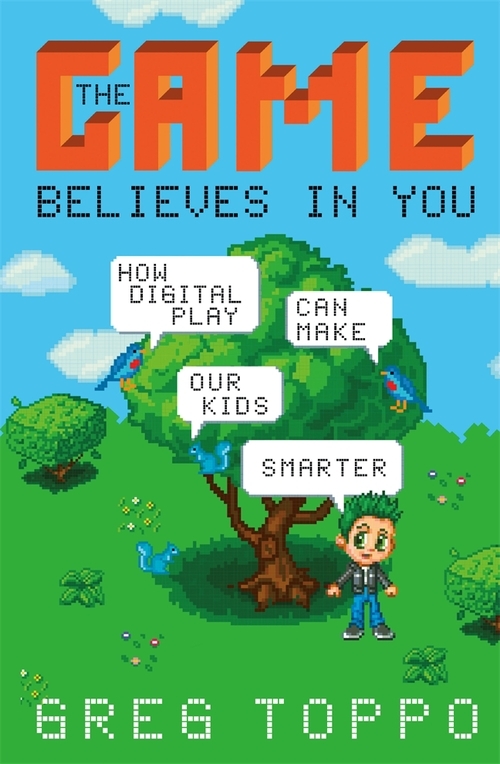 I had read The Game Believes in You largely because Jane McGonigal recommended it on Twitter. There is so much journalism that doesn’t cover games with much nuance so I take particular note when game designers point to work that they think does their craft justice. And for what it’s worth, I also recommend The Game Believes in You as well. It’s well-told journalism that investigates the promise of video games in the pursuit of learning. In doing so, the book uncovers the potential of games while being clear that the application of play in the classroom is not at all straightforward and it is all still a work in progress. From the book, I learned that the world of educational technology had significantly progressed since my own exposure to it as a young person. In fact, I was so taken by the book’s whimsical description of the game DragonBox, I downloaded it to try it out myself and quickly found myself happily feeding my dragon bugs, lizards and dice until I ever-so-gradually ended up doing algebra as my go-to casual game. While the capacity of games to provide scaffolding and a safe place to work out ideas is immense, I still believe that perhaps strongest potential of computer games is their ability to bring people together to play and compete and learn from each other. I’ve seen this first-hand from my son. Last year, my son went to a local chess championship arranged by the school board. He played well enough to qualify to play in a city championship, where he placed well enough to qualify for a provincial tournament. At the provincial tourney he achieved his personal goal for the event (to win at least one game) and ended up winning a door prize of art supplies. He also came back clearly infected with a growing fondness for the game of chess. Of course he would. During the course of my young children’s lives, I have played many, many, many card and board games with them. What I find particularly amusing is that there was only one game I refused to play with them — and it wasn’t Monopoly. I have a long-standing, deep reticence to the game of chess for reasons I won’t go into. And so, after the tournaments were done and my son was looking to play more chess, I gave him a subscription to chesskid.com and signed up him up for a week of chess camp. Since then, I occasionally drive him to chess meet ups at the public library or, like last Friday night, to local friendly chess tournaments. One of the largest challenges to learning chess is to find other players who are close enough to your own level of expertise. That way, you aren’t blown out of the water by an expert or bored by a challenger who is clearly not your equal. Years ago I took my son to a chess meetup where he was trounced by all the kids there. It was his success of the school tournament that re-kindled his interest in game. This is why I think the decision to design that tournament so that players would compete in small groups that resulted in a third of the whole as ‘first place winners’ was no accident or an indulgence to fragile self-esteem. To remedy the problem of matching players by ability level the world of chess have develop their own chess rating system where players establish their own rating number through the process of tournament play. My son earned his first chess score at the provincial tournament. He has since developed one through chesskid.com and that rating number is now slowly growing past his tournament mark. While I have become a more confident advocate of the potential learning of video games, I still can’t bring myself to play other people on chess.com. So, inspired by Kottke.org, I’ve decided to start slowly and start playing Mate in One, which is a collection of chess puzzles for the iPad. Chess will have to wait until I feel I’m ready for it. In the meantime, I’m going to download Dominion.